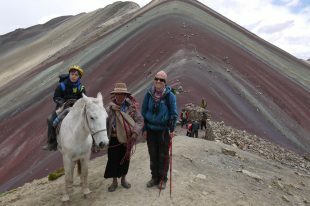 Patti McCarthy has just returned from the trip of a lifetime with Andean Trails that included Argentina, Bolivia, Peru and Ecuador. She enjoyed her trip so much and was fascinated by the hats (and the wearers!) she came across that she was inspired to write this hat blog. I have always been fascinated by the Bowler hat wearing Bolivian women, but hadn’t realised until we traveled there recently quite how widespread the custom was, where the custom came from, or the fact that Peruvian and Argentinian ladies also sported great hats. What a treat was in store – a milliners paradise! The Bolivian women are known as ‘Cholitas’ and they wear not only splendid bowler hats, but flounced, flamboyant skirts made from a variety of richly textured, highly coloured and embroidered materials. Apparently this custom started when the Spanish colonialists arrived and brought with them the fashions of 16th century Europe, including full length silk gowns and crinolines. A number of the local women sought to dress like them, but both full length dresses and crinolines were eminently unsuited to life for most women, so a mid calf length was adopted and seven layers of petticoats instead of the hoop! Cholita wrestlers, La Paz, Bolivia. The bowler hats were added a little later and there are a couple of stories about how this came about. One of them is that this fashion was actually initiated by the Spanish men, who on finding that their bowler hats were not really practical for their new lifestyles, persuaded the Bolivian women that if they wore them instead, not only would they look extremely fashionable but also look very appealing to potential Spanish husbands. Somehow this sales pitch worked and the bowler hat became a fixture. The other story is that a milliner produced a whole lot of bowler hats which were too small for the Spanish men, so the men persuaded the local women’s to wear them instead, as they were ‘all the rage’ in Europe. The hats are now available in a range of green and brown shades and are mostly made from rabbit skin or sometimes from a type of felt, made from alpaca wool. Cheaper versions are sold in street stalls, while a number of specialist shops exist for them too. The hats, and indeed the whole outfit, cost a small fortune by Bolivian standards but are considered an investment in a woman’s future. Although it tends to be only older women who wear this outfit every day, many young women have a ‘Cholita’ costume for special occasions. Married women wear the hat straight, whereas unmarried women and widows wear them at an angle. No pins or ribbons are used to keep the hat in place and it’s a sign of good breeding to always be able to keep the hat in place! We also saw a range of other interesting hats in Peru – more bowler hats, but also a ‘stovepipe’ design not unlike the Welsh national costume – and also in Ecuador, where a Fedora style was popular with both men and women. Wherever we were, the hats were a stylish addition to any outfit! If you fancy a holiday to Argentina, Bolivia, Peru or Ecuador to explore hats or other things, please do get in touch with us at Andean Trails. Peru is a fabulous country for the tourist – the locals are beautiful people: warm and friendly and helpful. It’s a country of stark contrasts, between the Andes and the Jungle, the majesty of Machu Picchu and the higgledy-piggledy unfinished buildings in the villages, the pristine cities where there is no litter, to the smaller villages and open country where litter abounds. Overall, I would highly recommend Andean Trails to anyone wanting to travel to Peru. We had a wonderful and exciting trip, and were very pleased with the standard of the hotels, transport, guiding, food, itinerary. The overall organisation was brilliant. I would say the best guides for me were in La Paz and the local guide in Uyuni. Also Oswaldo our trek guide and the whole organisation there were brilliant. The accommodation was fine – a little cold in Uyuni, but not much can be done about that! The food was very good all along and I had no troubles there at all.